Don't leave your device alone, even for a minute! 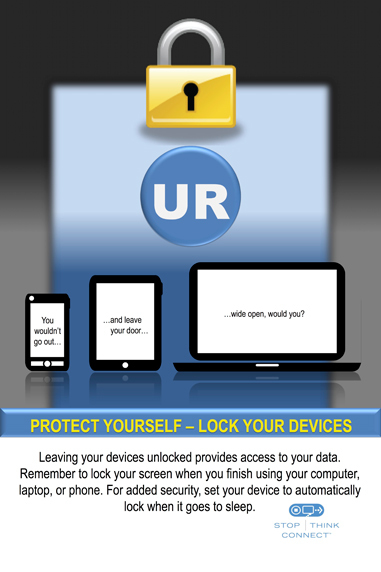 If you're not using it, lock your device in a cabinet or drawer, use a security cable, or take it with you. It's not enough to simply ask the stranger next to you in a library or coffee shop to watch your laptop for a few minutes. Differentiate your device. It's less likely that someone will steal your device and say they thought it belonged to them if your device looks unique. Sometimes these markings make the laptop harder to resell, so they're less likely to be stolen. Use a permanent marking, engraving, or tamper-resistant commercial asset tracking tag. Delete sensitive information. Don't keep any restricted data on your laptop. We recommend searching your computer for restricted data and deleting it. Restricted data includes your Social Security number, credit card numbers, network IDs, passwords, and other personally identifiable information. You'd be surprised how easy it is to forget that this information is on your computer! Encrypt information. Protect your personal data with the built-in disc encryption feature included with your computer's operating system (e.g., BitLocker or FileVault). Record the serial number. Jot down the serial number of your device and store it in a safe place. This information can be useful for verifying your device if it's found. Install software. Install and use tracking and recovery software included with most devices (e.g., the "Find iDevice" feature in iOS) or invest in commercial products like LoJack or Prey. Some software includes remote-wipe capabilities. This feature allows you to log on to an online account and delete all of the information on your laptop. There are both paid and free versions of this type of software, and each provides different levels of features. Search online to find the best combination of cost and functions to meet your needs.